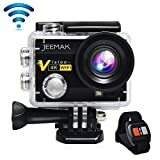 【New Design 4K Sport Camera】JEEMAK Action Camera shoots 4K and an impressive 1080P for slow motion capture. Including time-lapse and loop recording makes this an excellent choice for sports enthusiasts and home users who want flexibility in video quality and resolution. 【Wireless Wrist Remote Control Action Camera】The wrist 2.4G wireless RF Remote Control is a flexible partner and can capture your world in an all-new way.The camera remote control range can reach 20 Meters.It will not let you miss the wonderful moment. (Note: Remote Control can be used 5M underwater). 【2” HD Display + 170°Ultra wide angle lens】Amazing 2” HD Display, Real time display for better framing view and excellent playback effect.The 170° super wide-angle lens make your videos wider, sharper, clearer and less distorted. 【30m(98feet) Waterproof】With the provided durable waterproof shell,this camera can go as deep as 30 meters underwater,and capture the wonderful underwater world for you. 【Powerful Batteries Life & Full pack Accessories】2 rechargeable batteries included in the package! Never run out of battery life again! Double your recording time and enjoyment now!. With tons of accessories for you to attach the camera to helmets, bike, surfboards, cars and other objects easily. -To Those Who Love Outdoor activities ! -Features ultra HD 4K video recording and capture stunning views. -Supports 4K/30FPS, 2.7K/30FPS, 1080P/60FPS, 1080P/30FPS and 720P/90FPS(Slow motion) without freeze or skip. -Get easy control when the camera is mounted on your helmet, selfie stick, etc. -Freely switch video/photo on the remote control as you recording. -NOTE: Please insert the micro SD Card before activating the remote control. -Then use the”XDV”APP to connect the camera with your phone, the “XDV” allows you to share your previous moment with your friend and family via text, email, Facebook, Twitter, APP available for Android and IOS. Note: Micro SD Card of Class 10 or above is highly recommended for 4K Action Camera. Supports up to 32GB Micro SD Card.